Top ANB striker Belrum Vartanian got well-acquainted with the Durham United FC goal posts during Friday night’s League1 Ontario soccer match. Vartanian did score what turned out to the winning goal, but had another half-dozen superb chances to score. He was turned aside a few times by in-form keeper Eugene Alves, who stopped several gift-wrapped chances (including a beauty from speedster Raheem Edwards), but he couldn’t deter Vartanian from getting his sixth of the season in the second half. The pacy striker broke down the middle, taking a through pass, chipping it by the defender and sprinting from the halfway mark to slip the ball by Alves in the sixty-fourth minute. Had he not hit the woodwork three other times, the final 2-1 scoreline for ANB would have been far more one-sided than it turned out. That winner by Vartanian followed a first-minute (thirty-fourth second to be exact) goal by ANB forward Jason Mills, who startled a flat Durham United FC defence and beat Alves to put the visitors up 1-0. Durham's Le Rohne Young made a nice outside-inside move at the top of the box, and beat teenage keeper Ali Ghazanfari in the ANB goal in the seventy-eighth minute to make for a nervous finish to the match. It was Young’s ninth goal of the season for Durham United FC. But Durham got the result it deserved, as ANB had more of the play and the lion’s share of the chances. The victory put ANB in seventh place, and gave them a five-point bulge over Durham with fifteen points on thirteen games. He was pleased with his own game and happy to find the net even if it was only the one time. “I was playing well, but I was really unlucky; I hit the post three times. I think we played well, but overall we deserved to win - we had more chances,” said Vartanian. Young keeper Ghazanfari, yet to turn seventeen, wasn't fazed by playing against many players far older than him. “I’ve been used to it before, last year I played in the OSL under-21 league. It wasn't to the level of League 1, but it helped me. This year I’ve been playing U-20, and the coach felt I was ready [to come up]. 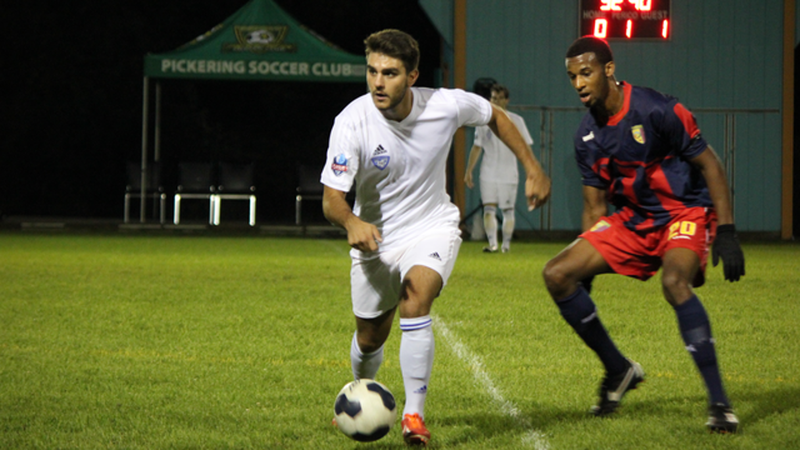 ANB coach Bassam Naim said he would take the three points on the road at Pickering’s Kinsmen Park field, but wasn’t too thrilled with how his club played. “We had nine chances; we have to keep working on things. I didn’t like the way we moved the ball, hardly any productive possession, hardly any through balls. We have some decent quality players who can put it together,” said the coach. “How are we going to improve the level of soccer in this country if we just win by hoofing balls. It’s not productive. I’ll take the result, but you don’t build only on results, you build on performance,” he said.